Free download Snooker 147 game. 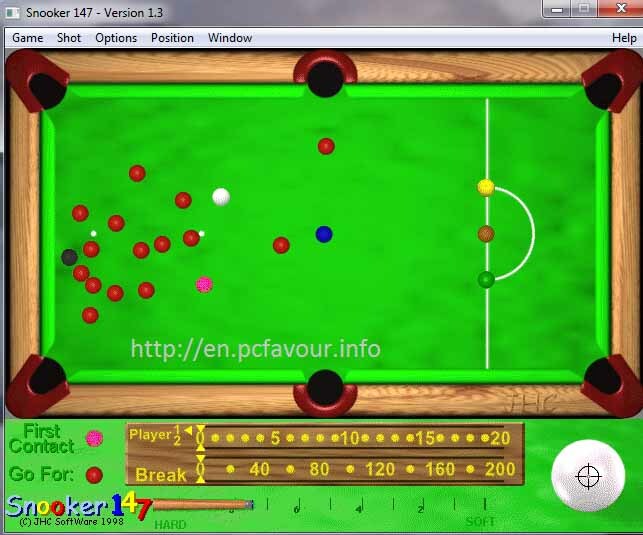 Download snooker 147 PC game from high speed direct download link. Snooker 147 is very old and popular game for snooker players and fans. This game was developed in decade of 90s by JHC Software Ltd. Snooker 147 follows the all rules of real snooker. You will enjoy the game as you are playing a real game. By default, player 1 is you and player 2 is computer. You can change player 2 if you want to play this game with your friend. You have to only uncheck the “Computer Player 2” from Options. The game is very easy to play with your friend with single mouse because it does not require both players to play at a time. The gameplay is very easy and also provide you some guide. For beginner, it will guide you what ball has to be hit. You can check this from “Go For:” option at the bottom. If it shows red ball, you can hit any red ball and if it shows a multi-color ball, it means that you have to pool any color ball other than red. These color balls will pool only if you send a red ball into pocket before. At the start of the game, you or player 2 has to break the pack by hitting any red ball. You have to hit red ball whenever you have your turn. If you hit any other ball than red then it will be counted as foul and you will lose your turn. After pooling the red ball, you can put any color ball into pocket. You can also set the target at cue ball (White ball) from the bottom where you can see white ball. For example, if cue ball and target ball are near the pocket then your cue ball will also go into pocket with target ball and it will be counted as foul in case you hit it normally. So to avoid this, set the target at the bottom of the white ball, you ball will be reversed back after hitting the target ball.